The ATtiny85 is a great processor for simple stand-alone battery powered projects. This describes how to get the power consumption down to maximise battery life. The project is a simple 15-minute timer that flashes an LED once every 2 seconds while it is counting down, and then beeps when the time has expired. The ATtiny85 seemed like the ideal choice for this simple project; it's low cost, in a convenient 8-pin package, and it provides 5 I/O pins, ample for this project. It also has a low-power sleep mode which is ideal, because it avoids needing to have an on-off switch. You can build a programmer for the ATTiny85 using an Arduino Uno board , but I chose the easier option of using SparkFun's Tiny AVR Programmer (available in the UK from Proto-PIC). You can program the ATTiny85 using the Arduino development environment, and there's a good tutorial on how to do this on SparkFun's website . 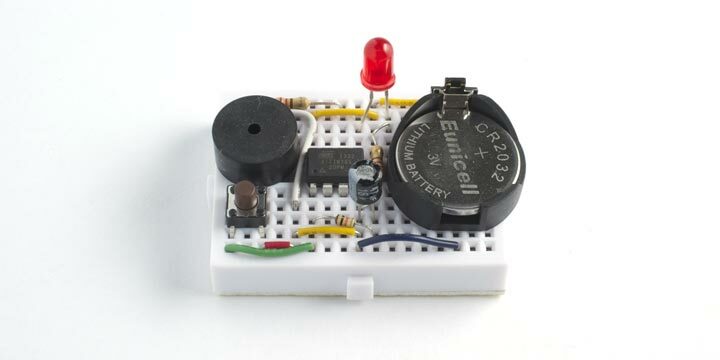 By default the ATtiny85 provides a 1MHz clock using an internal oscillator. You can also have an 8MHz internal clock; to do this choose ATtiny85 (internal 8MHz clock) from the Board option on the Tools menu in the Arduino environment, and then choose Burn Bootloader from the Tools menu. Note that this doesn't actually install a bootloader on the ATtiny85; it just sets the clock fuses. There's also an option for an external 20MHz clock, which uses two of the I/O pins; I haven't tried this option. With an interrupt on pin 0. With a pin change interrupt. With a start condition on the Universal Serial Interface. These options will be explored in future projects. The processor will also wake up on a reset signal, which is what I'm using here. The Analog Comparator, Brown-out Detector, and Watchdog Timer, and Analog Input Buffer are not enabled by default, so there's no advantage in disabling them. It's usually recommended that you program all outputs as inputs before going to sleep, but I couldn't measure any advantage from doing this so I've ignored it. That's a theoretical battery life of 40 years with a 200mAH CR2032 coin cell, well over the shelf life of the battery! ^ Arduino Board as ATTiny Programmer on High-Low Tech. 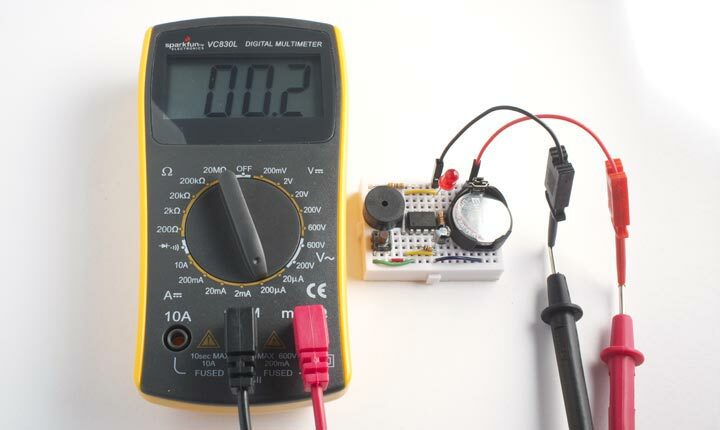 ^ Tiny AVR Programmer Hookup Guide on SparkFun.